Do you have a few favorite photos? Actually, most of us have more than just a couple. Today its easier than ever to take & share photographs. That’s why making and selling picture frames are a great DIY craft to take a look at. This is also a good choice because most picture frames are small to medium sized. So your project costs will be budget friendly overall. For some DIY projects, you may even find that using refurbished items, such as pallets gives you a wonderful look. When making photo frames, start by thinking of the recipient of the frame – “who is this for?” We know you’ll be especially successful if you make photo frames for family photos, Dads, Moms and kids to name a few ideas. Many who like to pick out a photo frame also love having the ability to share more than one photo – so try to think and look for DIY projects where several can be easily displayed. We have 40 great DIY projects here for you to try. There are projects ideal for both beginners and advanced project doers. If you want to make digital photo frames or to use technology, we’ve found a couple of fun projects to try. You’ll also see some larger frames, ideal to give as housewarming gifts – something that many who buy photo frames are looking for. Remember one of the best ways to customize DIY projects is to add unique colors, patterns and your own style to them. That’s something your customers will look for, and why they will choose to buy from you. Happy DIY-ing and Crafting! 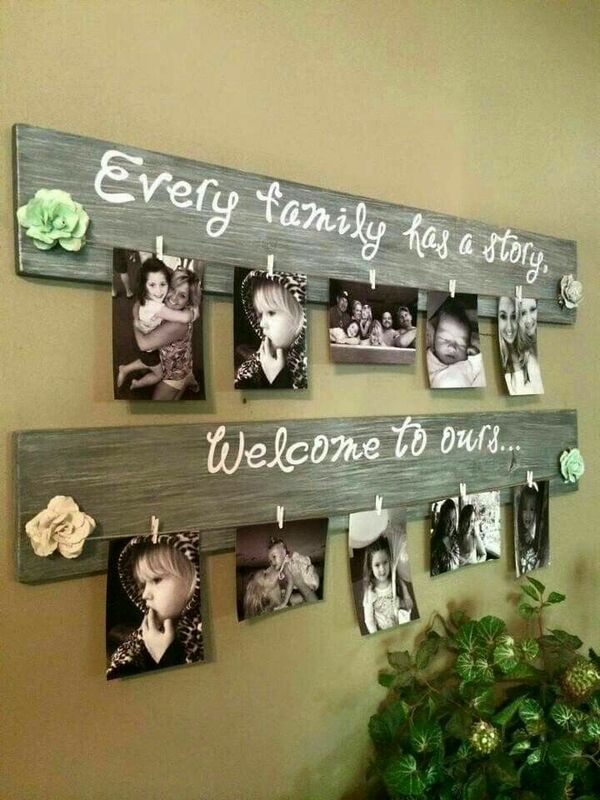 Here is a great way to capture family memories. You can easily share some of your favorites with everyone. Glass etching is a way to make any frame customized, with a personal message or a monogram. This is something that even a beginning DIY or crafter can do. This is a great way to share a few photos. A pretty style for the family room. You don’t have to pay for pricey photo cubes, make your own. Here’s a great DIY project. These create a warm glow in any room. You also can enjoy photos too! This is a fun, techy frame that will show you when family and friends are coming home. A project for experienced DIY-ers. Bright and colorful, here is a fun picture frame. Its perfect for a family vacation snap. Here’s a photo frame that’s all about Daddy! Perfect for Father’s Day, birthday or just because! Pallets are budget friendly and make great frames. Show of family photos easily with them too. Here’s a unique way to share photos! Make these fun luminaries. What’s old is new again. Here’s a fun frame to show off your Polaroids – or favorite Instagram pics. Give a picture frame a great look by painting it. You can customize it with your favorite colors. Want to make a classic wooden picture frame? Try this project, its great for a beginning DIY-er. Enjoy the outdoors inside. Here is a charming frame to make. Perfect for decorating a room, home office or a celebration. Make this simple photo frame banner! Here is a simple DIY frame with a Christmas theme. Perfect for gift giving. Love music? Make this guitar themed picture frame. Pallets are a great DIY material. Make pictures frames everyone will enjoy. Foam core is bright and colorful, a great way to try a new look. Try making these great DIY frames. Pallets are a popular material. Make a unique looking photo frame this way. Let great photos stand out in your family room with these frames. This is a great DIY project ideal for a beginner. Here is a unique way to enjoy a lot of photos. You can change the photos all the time too! Looking for a beginner DIY picture frame project? Try this pallet wood one! Add an extra touch to a classic frame to make it special. This is a simple way to make any frame look pretty. Be eco-friendly and reuse an old window. It makes a great picture frame! Make photos into a real showcase in any room. This frame will be sure to get lots of compliments! Make a frame that everyone will compliment. This is a very unique look. An old window frame can make a great photo frame! This is perfect for a favorite large photo. This is a sweet and old fashioned look. If you like to sew, these are a great DIY project to try. Want to show of photos of your kids? Try these great hanging frames, perfect for the hall or the stairs too. Enjoy your favorite photos in a unique way, under the light of a lamp. This is a good project for an experienced DIY-er. Give your walls a contemporary and updated look with these washabi tape frames. Perfect for showing photos off. This is one of the coolest picture frame projects we’ve seen. Make a solar powered frame – to enjoy your photos! Here is a totally modern frame, made from washabi tape. Its ideal for a small photo. Like technology? Make this fun LED picture frame! Share your favorite photos in a totally personalized frame. Adding a monogram lets everyone know this is all about your family! Like papercrafts? Give this fun origami picture frame a try. Is Minecraft your kids’ favorite game? Make this fun photo frame. These photo frames were inspired by scrapbooking! There are bright and colorful. Here is a unique photo frame, ideal for a child’s room. This is a fun DIY project to try.